Esco Frontier® Floor Mounted™ Fume Hood is designed to provide comfortable space when users have to deal with large apparatus and hazardous containers. This fume hood is built with horizontal or vertical sliding sashes for ease of access when transporting apparatus into the hood. Although this type of fume hood is sometimes denoted as a walk-in fume hood, it is a misnomer. The user must not enter the hood while an activity generating hazardous fumes exists or when suspected concentration of fumes exists inside the chamber. 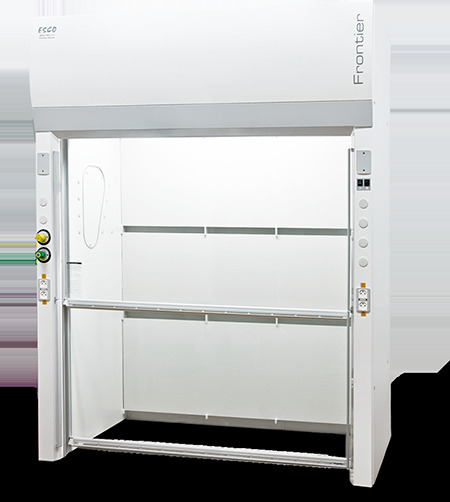 Each Frontier® Floor Mounted™ Fume Hood is tested to comply with ASHRAE 110:1995 Standard. Fully configurable optional Esco Sentinel XL™ microprocessor controller for hood performance monitoring and continuous display of face velocity. The alarm system will trigger should the face velocity within the work zone falls below the recommended setting. Esco Envirosafe Fume Hood Scrubber for air pollution control for water soluble chemicals present in the exhaust fumes.